Anjali Chadha, Preeti Krishnamani, Navami Jain, Sai Mamidala are young pioneers in eco-friendly approaches. Washington, DC, March 20, 2019 – Among the world’s most pressing challenges today are combating air and water pollution which are killing millions and damaging our environment. 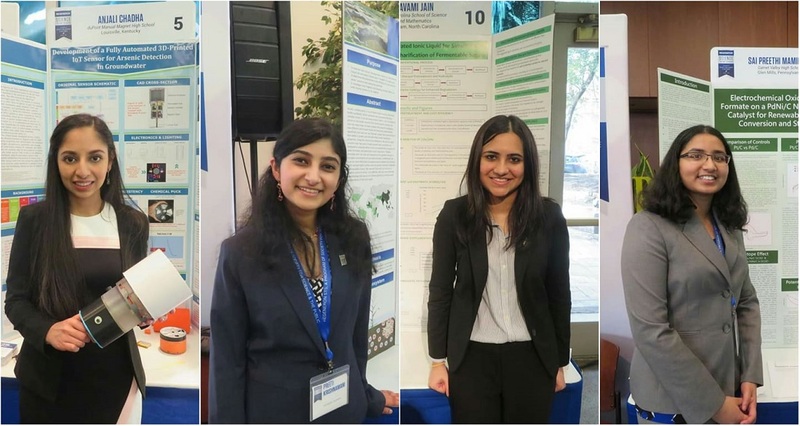 Intent on finding solutions to such seemingly intractable problems, four Indian American girls – all finalists of this year’s Regeneron Science Talent Search, the nation’s oldest and most prestigious science and math competition for high school seniors – have developed innovative approaches to addressing environmental issues and in the process, each has been awarded $25,000. Anjali Chadha, 16, of Louisville, Kentucky, has built a device that is a sensor for detecting arsenic, a harmful substance known to cause cancer, in well water sources. “It detects the arsenic levels in any given water sample by combining a chemical reaction with some electronics,” she informed us. Currently a student at duPont Manual Magnet High School, Anjali was inspired to develop the sensor when she discovered that groundwater within 90 miles of her home was contaminated with arsenic. It is estimated that some 50 million Americans use well water as their primary source, and could be at risk for contamination. Anjali’s new device is inexpensive to produce, very accurate, portable and can be used multiple times which makes it particularly applicable in the developing world where well over one billion people depend on well water. Noting that arsenic contamination is a huge concern in India, Bangladesh, Indonesia and Greece, among other countries, the teen innovator said, “Ideally, a whole community, a whole city can be sustained by just one sensor”. Anjali is interested in entrepreneurship and the start-up culture when it comes to career options and for that reason she intends to major in biotechnology, bioengineering when she heads to college. For Preeti Sai Krishnamani, 17, of Hockessin, Delaware, the essential goal was to combat arsenic contamination in rice. “The way I am trying to do that is by enhancing soil minerals that can bind up arsenic and make it inaccessible to rice plants,” she told us. Her solution is silicon amendments – rice husk and rice husk ash — which are waste products of rice production and can be recycled into paddies to eventually combat arsenic contamination in the crop. Currently a senior at the Charter School of Wilmington, Preeti mentioned that the burnt material, the rice husk ash, had more potential to combat arsenic contamination in rice. “It showed better results for increasing these iron-oxide minerals that can bind up the arsenic and prevent it from entering the plant through water,” she said. Arsenic easily contaminates ground water in India, China and Bangladesh – Asian countries where the largest number of people in the world are affected by chronic arsenic toxicity. In the US, contamination occurs more from industrial activity and the use of pesticides. Regarding actual testing, Preeti recalled that in June through August 2017 when she was involved in the research part of the project, she spent her mornings outdoors tending to the rice paddies and collecting samples. “That totally enriched my perspective about the problem,” she said. “I think if I was just inside a lab doing chemical extractions, I would have lost my awareness of the implementation that is so important to this project.” Someday, she hopes to be an entrepreneur in the space of agricultural technology. Navami Jain, 17, of Charlotte, North Carolina, performed a series of assays looking at different ways to produce bioethanol, a type of biofuel that is considered greener to conventional fossil energy sources as it is biodegradable and non-toxic. “The major controversy around ethanol production is that it is being produced from food-based crops like corn. I’m looking at ways to produce it from agricultural-based matter and different waste products such as wheat straw,” she explained. Her results indicated that producing bioethanol from wheat straw may increase efficiency and lower costs. Currently, a senior at the North Carolina School of Science and Mathematics in Durham, Navami is co-chief editor of Broad Street Scientific, the school’s journal for STEM research. She also co-founded an e-commerce platform that helps sell food waste for animal feed. In college, she would like to pursue a major in either biochemistry or chemical engineering, and a minor in dance which is her favorite pastime. Among her career choices are “working as a professional researcher in a university setting or pursuing an MBA and entering the biotech or bio-energy industry,” she said. Driven by the effects of fossil-fuel pollution in India, Sai Preethi Mamidala, 17, of Garnet Valley, Pennsylvania, studied an optimal catalyst to make renewable energy more accessible. “The biggest barrier to the widespread use of our renewable energy sources is the fact that we don’t have efficient storage regeneration processes,” she told us. “This bridges the gap between the amount of energy that is being produced by renewable sources today and the amount of energy that is demanded by the world. Right now, we mostly use non-renewable sources of energy, but those are not good for humans and they are bad for the environment,” she noted. Sai, a senior at Garnet Valley High School in Glen Mills, has examined the catalyst in “a fuel cell that can store energy while it is being produced and generate it when it is needed. The actual catalyst being used in the fuel cell makes a world of difference in its performance,” she said. The STEM advocate plans to major in energy engineering in college and, while embarking on a career, hopes to market her project and make it commercially viable. The Science Talent Search (STS), a program of Society for Science & the Public since 1942, was formerly known as the Intel Science Talent Search (1998-2016) and earlier was supported by Westinghouse (1942-1997). Regeneron Pharmaceuticals, Inc., a leading biotechnology company headquartered in New York, took on the STS from 2017 and ever since has been giving over $3 million in awards, annually. Founded by STS alumni, the company has committed $100 million in funding over the next decade. “The Regeneron STS is a wonderful platform for us to relay the scientific innovation that is happening to the public because the eventual goal of all science I believe is to help other people find truth and understand how we can live a better life,” Preeti said.